This design is screened on cloth—just follow the dashed lines for perfect Sashiko stitches! 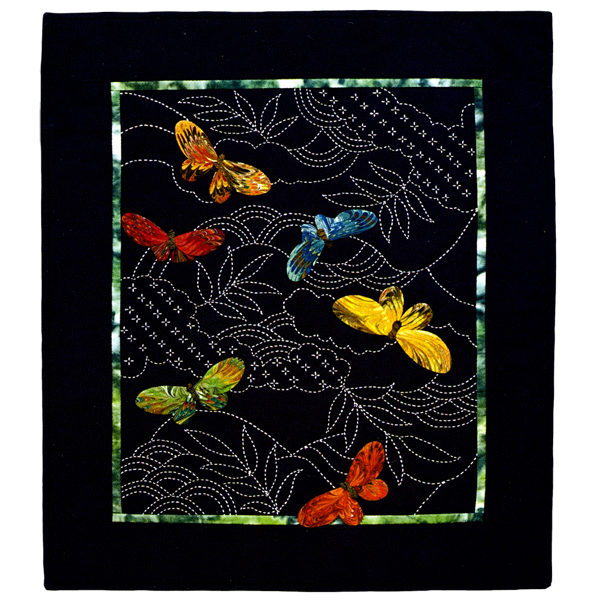 6 pieces of jewel-toned Marjorie Lee Bevis marbled cotton are included for the butterflies. Also includes inner green border, Kona border & binding fabric, one skein of white sashiko thread, sashimi needles, full-size pattern and instructions. Batting and backing fabric are not included. Marjorie Lee Bevis Marbled cotton is exquisitely intricate and meticulously created by an expert in marbling. Each piece of fabric in your butterfly kit is unique and the challenge is to find two mirror images for the butterfly wings. You can create the whole butterfly from one of the six fabrics or combine them with other colors for a totally different effect. For example, the big wings can be cut from the orange marbled fabric and the smaller wings from yellow. Butterflies cover the color spectrum, so there is no "right" way. Use your own eye and imagination to come up with a totally unique butterfly. Two skeins of white 22 yd. Olympus traditional sashiko thread are include in your kit. The whole thread is used, unlike embroidery thread that has strands that can be pulled apart. Sashiko thread is a loosely twisted Egyptian cotton that when stitched, has a characteristic fussy look that looks so dramtic against dark indigo. This design was inspired by a 200 year old kimono that I saw in a Japanese textile book in the Textile Museum in Washington D.C. I adapted the design to sashiko and added appliqued butterflies. This was the first fabric kit I offered with the design screened on cloth and has continued to be my most popular design. It can be made into a wall hanging, used as a center piece for a quilt, pillow, or incorporated into clothing.